OMG yesturday my dog decided to chew up the bottom part of the molding to my house. I didn't know how much he like to chew on wood. IT crazy cause the house has his chew toys everywhere. Off to home depot today to fix the damage, and go buy some bitter apple spray. That would have to be....golf balls - 22 to be exact. Jazz thinks they are a great toothbrush! tsuki got to the hub's lawn mowing shoes.. and ever so 'neatly' cleaned off all the embedded grass for him. And then played with it. All over the house. It's been awhile since Nemo has chewed up anything of signifigance. I guess that is one good thing about a dog getting a bit older. DJ - you should try rotating toys in and out of availability for your Shiba to get at. Toys that are out all the time become boring and old hat. I agree with Brandon - Jazz doesn't chew on a whole lot (older shiba, I guess) outside her toys. The only thing I can come up with are the golf balls and a small stuffed toy that was my nephew's. The golf balls were my fault as they were in an open box on the floor in a room that Jazz had access to - she got about 1/3 of the ones in there. 6 months ago....Baseboard to kitchen cabinet & trim....trying to get to a mouse overnight. Plastic was chewed as the dogs got up under in ....the evidence came out in the poop seen the next day. Per evidence both were guilty (LOL) ...They did catch the mouse later in the week though. I guess it came out of the hold that was opened. We repaired/covered up and fixed only to have the dogs maul the metal flang ....I finally gave up and let them check out the hole every once in a while. We plan to have the kitchen redone so I didn't freak too much. Last week I found one of my shibas jumping up against the refridge. Turns out she has a new form of entertainment......popping off the magnets and trying to pull off notes tagged on the front by magnet clips. Why ....cause it's fun.......Sheesh.....the things they think up. Believe it or not.....a book entitled, "Don't Shoot the Dog" by Karen Pryor. Ya think he's telling me something? chewed table legs & chairs... every table in the house! tried to eat my fingers and toes!!! The weird thing is they don't really tear anything up anymore. Well, Mika grew out of it a few years ago. What they do is steal stuff and lick it to death! I bought a Pooh Bear for my friend's baby last month. A week after I purchased the bear, I found it on the floor.....slightly damp. My dogs have turned on Isaac's wooden blocks today for some reason. They're all doing it, but Rakka can break them in half with one chomp, whereas the other two just leave little teeth marks. Rakka must have incredibly strong jaws because she can break almost anything before I even know she's chewing on it. For instance, I once put down a tupperware container for her to lick off and when she was done licking, she gave it one chomp and had a huge crack down the middle. Another time, I put her out on a leash to dry because she had gotten covered in pond slime and I turned around to do something and when I turned back, she had chomped right through the nylon leash! She also chewed up a marrow bone, even though everything I read says dogs are only supposed to be able to eat the middle. Oh yes, and let's not forget the time she chewed through a door to get out of a room. I'm lucky she's not all that inclined to chew forbidden items, or everything I own would be pulverized. Nothing much. The main door's door stop rubber cap, when he first came. 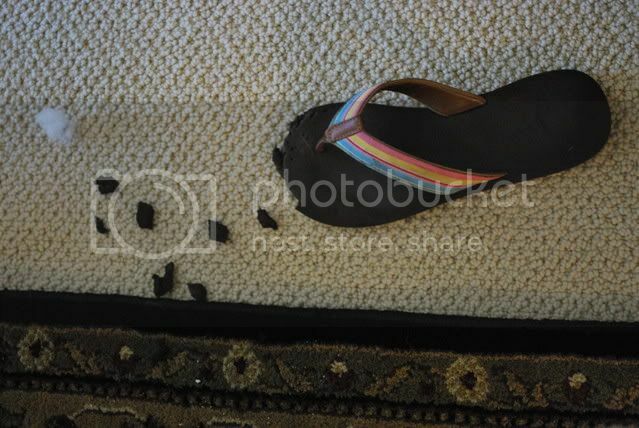 And lately, he chewed the strap of Nat's favourite flip flops, rendering them unusable. And he loves to get Nyx's toys when she drops them. Nowadays, it's the garden hose and sprinkler--if it's left out--and the house. Not to mention leashes or the tether--if she's left on them unsupervised. She occassionally has a pica habit, so I'll see her pick up rocks and try to naw on them. She's really good about not doing anything inappropriate in the house. When I first got Kimi, she chewed on leashes, her harness, a collar (don't ask how she did that. I came home from work one day and it was gnawed in pieces. ), a cell phone charger while it was plugged in (apparently she needed a jolt and electricution doesn't phase her), her dog house and the doggie pool. My shiba has chewed up a lot of things in our home: couch, wood chair, carpet, toys that aren't meant for shibas, walls, remotes, shoes and books. We leave out toys for her when we're out for work. We have purchased games that would get her to think, kong wobbler, stuffed toys and hide treats in her kennel and toys. But for some reason she still goes for our furniture and carpets. I don't get it what are we doing wrong? We give her the attention she needs, give her walks, take her to the dog park, and once in a while day care to socialize with other dogs. Please do not advise me to bring in a behaviorist.. we do not have that kind of money. 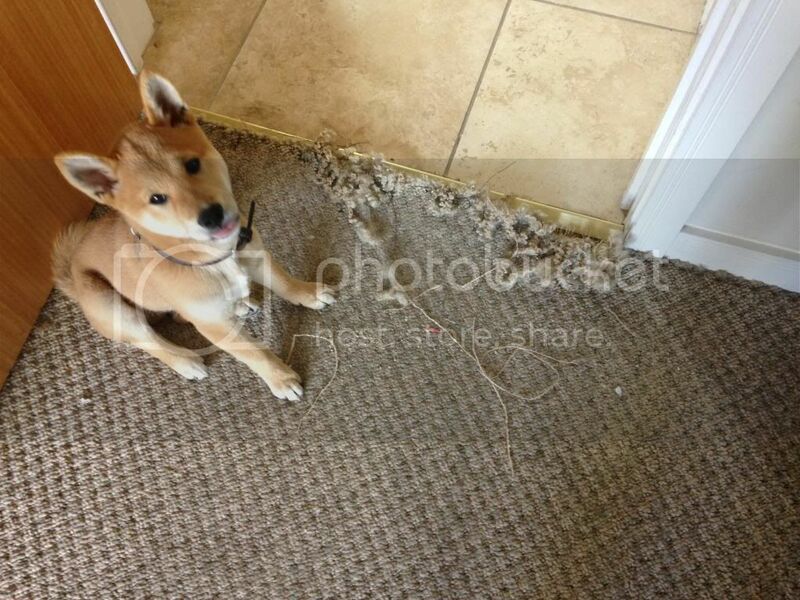 I have a friend that got a behaviorist, spent $$$ and the shiba is still chewing up things in the home. Also we did day care but again we're limiting out budget so we take her there once in a while. We're tried bitter apple, its not doing anything for her. We closed all the doors to other rooms, so that she hangs out in the living room.. we had dog tv on, but she just chews the couch away. I have left my face time on at work so i can watch her.. when i say her name she just looks up and chews away... Does anyone else have other advice they can give? i'm scared to purchase nice things for our place. @svgeronimo, if you can't trust her alone, then you need to crate her, pen her, or confine her to a safe room. Some dogs with separation anxiety can't really help it. Check out the behavior/training section for ideas to work on this. You could give her something special like a bully stick or dispensing toy to keep her occupied while confined. More extreme cases require medication to take the anxiety edge off, which even normal vets can prescribe. With her little brother Kouda, we use an ex-pen. He just sleeps when we are gone. Nothing... thankfully. She is 4 months old now and has never chewed up anything other than toys. We are very stern with her anytime she wanders away from a toy and starts to mouth anything else. If left alone I wouldn't doubt she would have gotten a few things... but she's never unattended and is crated while we are not home. I'm a little confused. You are scared to purchase nice things, but you say you don't have money for a behaviorist. Nice things cost money, so you must have some money to work with. Your dog isn't chew trained, so odds are she will chew new things too. Ian Dunbar has a free book on dogstar.com (I think that's the site.) Called before and after you get your puppy. It has good info on chew training. There are many other good dog books that discribe chew training. Basically you make a dog-proof room or pen. Your dog is only allowed free run of the house when you are watching her. If she chews something forbidden you tell her No (or whatever your no sound is) and then offer an approved chew toy. Praise her whenever she chews on her toys. You can even leash her to you in the home to help keep track of her. Bully sticks were recommended earlier as a good chew toy for your Shiba. The way this works is by rewarding the desired behaviour and manking the unwanted behaviour not work. You must be dilligent and generous when she gets it right. Chewing is instinctive and calming. Chewing is it's own reward, so your dog has been repeatedly rewarded everytime she chews on a forbidden object. You have to retrain that, and it will take time. This only works if you confine the dog to a chew-proof area when you aren't watching. Otherwise your smart Dog will learn to chew furniture only when you arent looking, and you wont be able to have nice things. Ex-pen, laundry room, mud room, spare room, there are many places you can make dog safe and chew-proof. An untrained dog can do a lot of damage to cabinets, so bathrooms and kitchens are usually not a good idea. Get a book on positive training and read it. Teach everyone on the house the new rules. Be strict but fair. Try to help your dog get to a good behavior so you can focus on rewarding and reinforcing it. With dogs you tend to get back what you put in. This will take time but it's worth it. Send from a tablet, please forgive typos. Edit to add: I see from your previous posts that this has been a problem since April, which indicates to me that you need the help of a professional. Chewing furniture is an entrenched behavior at this point. Ask around. Find a good behaviorist. Do what they say, put in the time and make the changes they suggest. Maybe your friend didn't find a good behaviorist. Maybe your friend didn't follow their advice. Either way, a professional is your best bet at this point. From the damage you describe, this a professional would be a lot cheaper than more destruction to your home. It looks like Raiden is from an akc breeder. Your breeder (a dog professional) will likely have good advice on how to address the chewing and separation anxiety. It sounds like separation anxiety. You need to do some serious work with her. And about her teeth. I'm sure chewing up misc items throughout the house isn't helping her teeth either. Not to mention the toxins found in paint, furniture finish, dye... she really needs to be crated or penned up for safety reasons. @svgeronimo like many have mentioned...you need to crate her up. Leaving her out when you KNOW she chews up stuff is not safe for your Shiba...or your wallet. My only advice is to TIRE HER OUT. Even if a dog is experiencing separation anxiety, tiring them out will help them relax. The fact that your dog had the energy to try to escape...chew the crate...constantly barking means you guys don't exercise your dog enough. 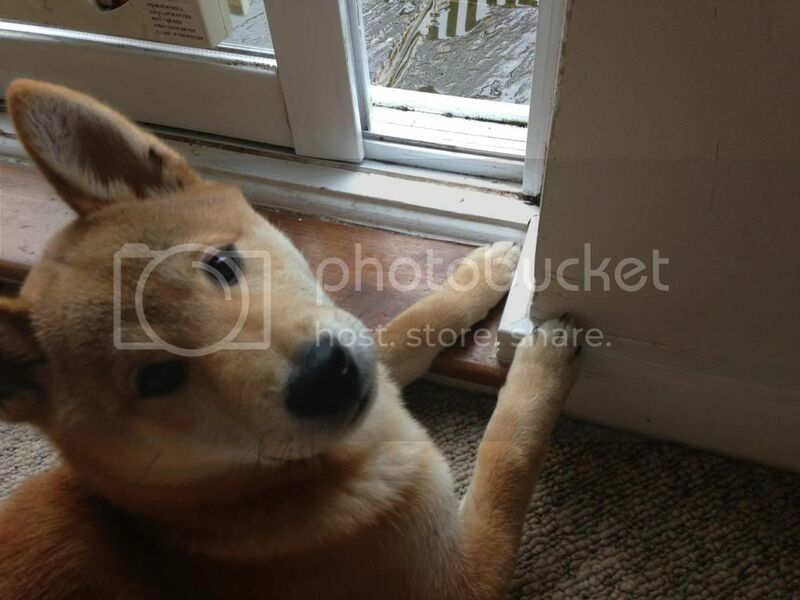 Believe me, I've taken in a fellow shiba member's dog who has separation anxiety. I give them a LONG walk before work. He barks/whines for the first 10 mins but he settles down after since his energy was drained during the walk. Does Raiden sleep in your bedroom? Sleeping in your bedroom, with her pack, can really help with security. Moving the sleeping crate to the bedroom can help with anxiety sometimes. When you leave the dog, rub a chew toy between your palms for a couple minutes. This leaves your scent on the toy which can help calm your dog. Your things all smell like you, which may be why she prefers chewing them. Her toys just smell like plastic. But really, call your breeder. @svgeronimo, with your new info it sounds like her problem is a bit more severe. And I do agree that there are no good behaviorists in our area. There is no quick fix even with meds and training. It's all about shaping and rewarding good behavior. It takes lots of time to slowly get her used to increasing time away from you. While I don't think a muzzle is the right answer for this problem, using one is similar. You can't immediately put it on her and expect her to accept it. My trainer sometimes boards dogs for clients, and has a solid aluminum crate with air holes for "special" dogs. Maybe something like that would be safer for Raiden. The best muzzle I've seen is the Baskerville Ultra, which has padded straps and attaches to a collar (which can be attached to a harness with a carabiner). And it comes in baby blue. There is no quick fix even with meds and training. It's all about shaping and rewarding good behavior. Zandrame couldn't have said it any better. Teething puppies want and have to chew. Especially when excited. I always have a toy with me to divert Kira's attention from chewing something that she shouldn't be. If she's caught gnawing on something she shouldn't chew, we immediately give her something she can. Thought I'd repost this article here. It's a very good article and offers some solutions in dealing with SA. My poochie probably has a lot of faults, but at least in this case he's never chewed up a single thing. Not even his own things. He still has toys I got him on his first day with me, in a "just unwrapped" condition. He plays with them all the time. On a related note, he's not a very good tug of war dog. His grip is weak. He loses tug of wars with other doggies (no contest). I've checked his teeth and play tug all the time (he loves it), but he's just always had a very weak bite. Doesn't appear to affect his eating habits.. He did use to chomp on toes when he was little but that behavior vanished quickly. @tatonka Juni is exactly the same, she has the weakest bite ever. Everything she picks up she drops after a few seconds. She used to enjoy ripping paper and nibble on labels (on clothes or such), but never really damaged anything. Only toy she's destroyed was a squeaky toy made of rabbit fur. And she got a squeaky toy as a pup and played with it for hours before she managed to make it squeak. It surprised her so much she looked up to the ceiling to find where the sound came from. So it was a bit of a surprise last christmas when we heard a yelp from the livingroom and then Juni came running to us in the kitchen all shaky and upset. Turns out she had been nibbleing on the label on the chord of the Christmas tree lights and bit a hole in the chord getting an electric shock. Poor thing.